At the eastern end of Coral Coast, only a short drive from Suva, lies Pacific Harbour, Fiji's self-styled adventure capital. On the 3rd (Sun), see some colorful creatures with a scuba or snorkeling tour and then kick back and relax at Paradise Beach. On the next day, meet some fierce fish with a shark diving experience. For ratings, more things to do, photos, and more tourist information, refer to the Pacific Harbour trip planning website . Milan, Italy to Pacific Harbour is an approximately 34-hour flight. The time zone difference when traveling from Milan to Pacific Harbour is 11 hours. Traveling from Milan in June, you can expect nighttime temperatures to be somewhat warmer in Pacific Harbour, with lows of 24°C. Wrap up your sightseeing by early afternoon on the 4th (Mon) to allow time for travel to Taveuni Island. Known as the Garden Island, Taveuni is a tropical paradise of tall mountains draped in lush rainforest, filled with delicate wildflowers and colorful birds, and dotted with cascading waterfalls. Get outdoors at Scuba & Snorkeling and Lavena Coastal Walk. You'll discover tucked-away gems like Bouma National Heritage Park and Waitavala Natural Rock Waterslide. Next up on the itinerary: admire the sheer force of Tavoro Waterfalls. For photos, maps, ratings, and more tourist information, use the Taveuni Island trip itinerary planner. You can do a combination of bus and flight from Pacific Harbour to Taveuni Island in 4.5 hours. Another option is to do a combination of bus and ferry. Traveling from Pacific Harbour in June, expect a bit warmer with lows of 34°C in Taveuni Island. Finish up your sightseeing early on the 7th (Thu) so you can travel to Suva. Situated on a verdant, hilly peninsula, Suva is the second-largest city in the South Pacific and has been the capital of Fiji since 1882. On the 8th (Fri), examine the collection at Fiji Museum, relax and rejuvenate at some of the top local wellness centers, then browse the eclectic array of goods at Suva Municipal Market, and finally identify plant and animal life at Colo-I-Suva Forest Park. Here are some ideas for day two: tour the pleasant surroundings at Albert Park, get a taste of the local shopping with 21K Gallery, and then buy something for everyone on your list at TappooCity. To see reviews, more things to do, maps, and other tourist information, you can read our Suva trip planner. Traveling by flight from Taveuni Island to Suva takes 2 hours. Alternatively, you can do a combination of flight and bus; or ride a ferry. Plan for a bit cooler nights when traveling from Taveuni Island in June since evenings lows in Suva dip to 30°C. Finish your sightseeing early on the 9th (Sat) so you can travel to Savusavu. Kick off your visit on the 10th (Sun): admire the natural beauty at Flora Tropica Gardens, get outside with Jean-Michel Cousteau Resort Activities, then take in the dramatic scenery at Vuadomo Village and Waterfall, and finally take a memorable tour with Tours. Get ready for a full day of sightseeing on the next day: witness a stunning natural landmark at Savusavu Hot Springs, look for gifts at Savusavu Farmers' Market, and then admire the sheer force of Nakawaga Waterfall. To find reviews, other places to visit, maps, and other tourist information, you can read our Savusavu trip itinerary builder app . You can do a combination of taxi and flight from Suva to Savusavu in 1.5 hours. Alternatively, you can do a combination of flight and taxi; or do a combination of ferry and taxi. June in Savusavu sees daily highs of 31°C and lows of 31°C at night. Finish up your sightseeing early on the 12th (Tue) so you can travel to Nadi. Home to the country's primary international airport, Nadi serves as the gateway to Fiji. Take a break from the city and head to Scuba & Snorkeling and Natadola Bay Championship Golf Course. You'll discover tucked-away gems like Adrenaline & Extreme Tours and Stand-Up Paddleboarding. Venture out of the city with trips to Sigatoka (Kula Wild Adventure Park, Nature & Wildlife Tours, & more). There's much more to do: head off the coast to Robinson Crusoe Island, get some thrills out on the water with a waterskiing or jet-skiing adventure, browse the eclectic array of goods at Nadi Market, and admire the natural beauty at Garden of the Sleeping Giant. Plan my Nadi trip by asking Inpirock to come up with tips and suggestions. Fly from Savusavu to Nadi in 1.5 hours. Alternatively, you can do a combination of taxi and flight. 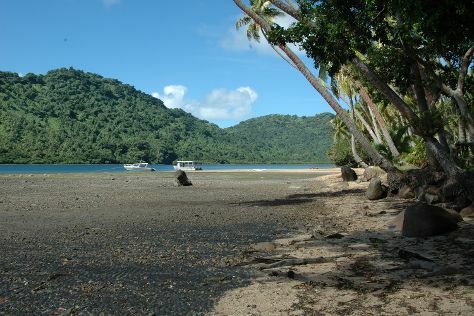 Traveling from Savusavu in June, plan for a bit cooler nights in Nadi, with lows around 23°C. Wrap up your sightseeing on the 16th (Sat) to allow time to travel back home.